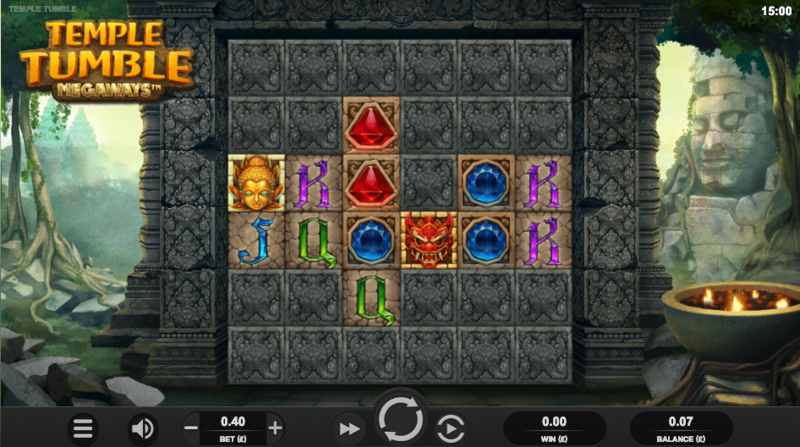 A virtual trip to the ancient temple complex at Angkor awaits those ready to try out this online slot from Relax Gaming – it’s called Temple Tumble Megaways and it employs some clever gameplay to move you closer to the free spins round. Temple Tumble Megaways plays out on the sides of a temple wall as shown in the screenshot above with carved faces and the famous tree roots of Ta Prohm visible in the background. Wins are formed by creating matching combos on adjacent columns starting from the left hand side and when that happens those symbols will disappear along with any neighbouring grey blocks – more symbols will now fall in to take their place and this process will continue until there are no more wins. The high value symbols include a representation of the Buddha, a dragon mask, gems in red, blue and green and then J, Q, K and A. The chap with the beard (some sort of grave robber no doubt) is wild, he appears on columns two to six and he’ll replace all others symbols to help form winning combinations. Multipliers – some blocks contain multipliers of 1x, 2x or 3x which will be applied to those wins. Extra Spins – some stone blocks contain 1, 2 or 3 extra spins. Multipliers + Extra Spins – some stone blocks contain extra spins or multipliers. 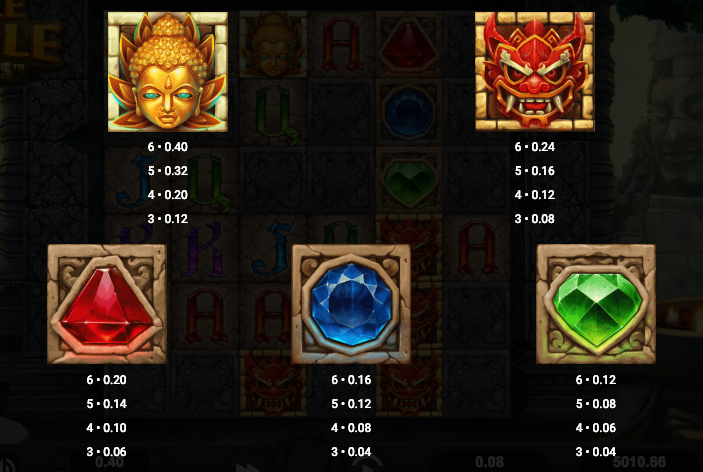 Clearing out all the stone blocks in any of the above modes will award an additional three free spins. Individual wins may seem small in Temple Tumble but they soon mount up after a few successive winning combos so don’t be put off – the graphics are great, the gameplay is engaging and this is a top notch addition to the Megaways series of slots.